New Community is going to Virginia Dare Apartments in Elizabeth City to host a Game Night! On Friday, March 8th, we will be welcoming the residents from the apartments to enjoy a night of fun, food and friendship with us. If you would like to help serve the men and women living here, we’d love to have you with us! There are a few different ways to be involved in this FIVE.16 whether you’re playing games with those who attend, providing a finger food for them to enjoy or helping with set-up, this is a great blessing to our neighbors often overlooked in our community. Please let us know if you’d like to join us by stopping by the Information Center this Sunday! Thanks to your generosity, New Community Church will be serving the staff at Pasquotank Correctional Institution (PCI) this March. Our Giving It All Away offering, collected at Christmastime, is funding our church to say “Thank You” to those who keep our community safe. We want the prison staff to know they are appreciated on a regular basis. Grab a few “Thank You” notes from our Information Center. Share some words of encouragement and gratitude. Return the cards to NCC’s Information Center by Sunday, March 11th. Like to bake? Awesome! We need individual packages of baked goods (cookies & brownies without peanuts) for our Thank You packages. Please drop-off at NCC by Monday, March 12th. Join us for a packing party from 6:30-7:30pm Monday, March 12th, to assemble packages for PCI staff. Help deliver packages to the prison on Tue, March 13th or Fri, March 16th. Times to be announced. We are looking forward to seeing our church serve and love our local heroes. Thanks for all the ways you continue to become a Compelling Presence for Christ in our community. We’re bringing a home-cooked dinner to the A-School! Thursday, August 24th, New Community Church will be participating in our next whole-church five.16, serving our local U.S Coast Guard A-School students dinner. That evening, we’ll have time to meet approximately 200 students, encouraging them while here in Elizabeth City. 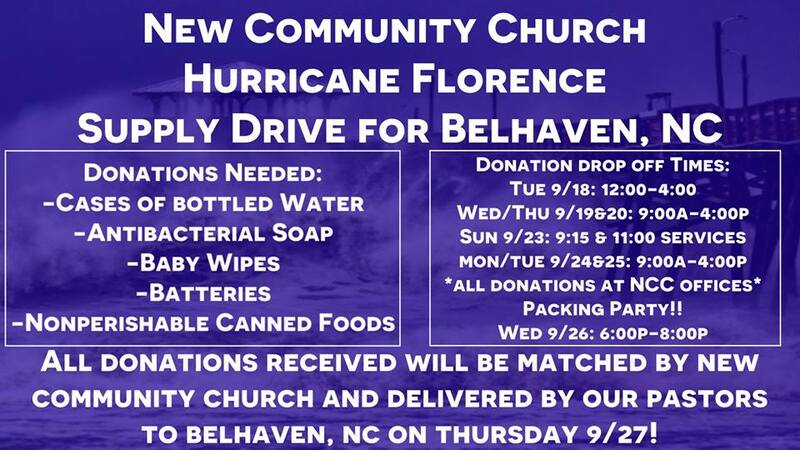 All the food and supplies will be purchased with money collected from last Christmas Eve’s Giving-It-All-Away offering. In order to make this a great night, we’ll need people to help set-up, prepare foods, serve dinner, clean-up and visit with our Coastie students. Please sign-up at the Information Center on Sunday morning to join us. We’ll need your identification information ahead of time to be permitted on the base.